It’s no surprise when politicians are lawless and fail to follow the Constitution that they will advance legislation that is also lawless and seek to criminalize law-abiding citizens. 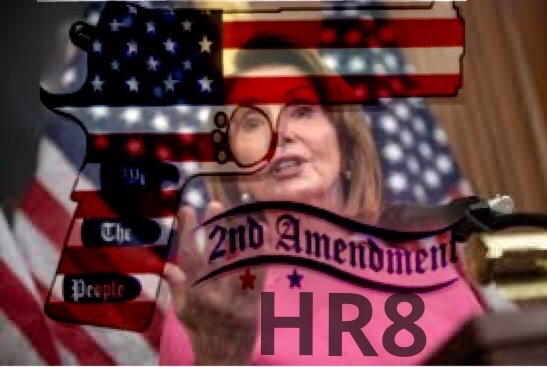 Take HR 8, which House Speaker Nancy Pelosi is advancing in the House of Representatives, which would criminalize private transfers and effectively register all gun sales. Pratt says that either Pelosi and her anti-gun team are “profoundly stupid or genuinely evil”. While he gives her the benefit of the doubt that both could possibly be correct, in reading the bill, Pratt sides on the genuinely evil side. HR8 is scheduled to receive a hearing in the House Judiciary Committee this week. According to Pratt, the bill has been “crafted” with “dozens of trap doors” that if they are actually enforced could “put millions of gun owners in prison. We know that the ATF, in connection with annual inspections conducted under federal law, is increasingly copying these forms to its database in a centrally accessible format. Here are just a few examples of this kind of tyranny. * Confiscation in New Orleans. “No one is allowed to be armed. We’re going to take all the guns,” said P. Edwin Compass III, the superintendent of the New Orleans police, right before several law-enforcement agencies began confiscating the firearms of lawful gun owners in the wake of Hurricane Katrina (2005). * Justice Department initiates registration (1994). The Justice Department gave a grant to the city of Pittsburgh and Carnegie Mellon University to create a sophisticated national gun registry using data compiled from states’ background check programs. This attempt at registration was subsequently defeated in the courts. * More gun owner registration (1996). Computer software distributed by the Justice Department allowed police officials to easily (and unlawfully) register the names and addresses of gun buyers. This software—known as FIST—also kept information such as the type of gun purchased, the make, model and caliber, the date of purchase, etc. This demonstrates how easily background checks can be used to register gun owners’ information. Any and all gun laws are unconstitutional. Congress has not been given authority to write legislation that restricts or regulates our right to keep and bear arms, and the president has not been authorized to sign any such pretended legislation. This issue right here refutes any claim that we are united in America and that that union is strong. Those who side on the side of the law and the Constitution must stand and be counted, calling your representatives and telling them to shoot down this bill, along with any other unconstitutional legislation that comes to the House, the Senate or the president’s desk.